I’m a massive fan of honest winemakers. 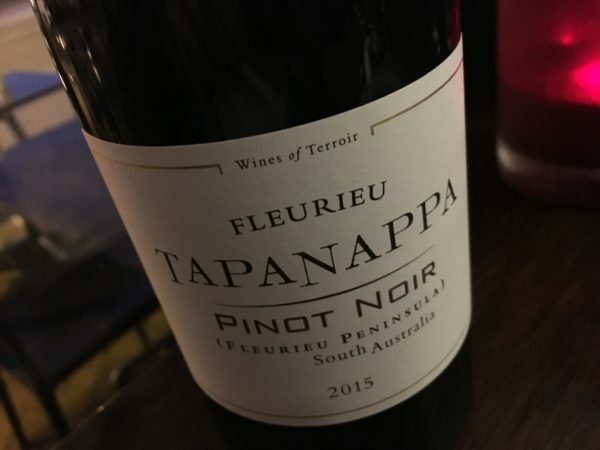 That’s why it was refreshing to learn the story behind this ’15 Tapanappa Pinot Noir from Brian Croser. According to Brian, he let his eye off the ball and the yields at the Foggy Hill Vineyard got away a bit. Not enough to destroy the crop (yields up circa 25% up on normal), but enough that he didn’t think it was up to Foggy standard..
As a result, he declassified the lot, dropping it from a $55 single vineyard wine to the more generic $39 ‘Fleurieu Peninsula’ label. Historically there has regularly been two tiers, but this year it all went into the cheaper wine. After chatting with him over dinner recently, Brian admitted that he’s now beginning to regret that decision (and his bank manager doesn’t like it). But the principle is admirable. Produced from what was a ‘normal’ vintage in many ways (heat summation of 1113C vs the average of 1135C), this hardly tastes like a ‘2nd wine’ either. Rather, it’s a structured and serious Pinot in a clever mode. Perhaps the only challenge here is a recurrent one with South Australian Pinots – and that is a lack of delicacy. That’s a sweeping generalisation sure, but there remains very few genuinely elegant Pinots from the Adelaide Hills, Fleurieu Peninsula etc. Still, the flipside of a slight inelegance is flavour breadth and length, both of which this wine has plenty of. On first open I thought this looked a little oaky, with the vanilla lacquer of (quality) French oak a slight distraction. But with air, the red cherry and plum fruit rolls through, and the thickness through the middle and long finish an ever constant reminder of just how serious a wine this is, no doubt helped along by plenty of time on skins, with just a little alcohol warmth to finish. In some ways this is just a bit dense to be beautiful. But the longer you look, the more you appreciate the A-grade nature of this wine, with a sense of class at every corner. Will only get better with bottle age too. Best drinking: 2018-2025. 18/20, 93/100, 13.4%, $39. Would I buy it? I’d like some in the cellar, as it will no doubt look excellent in 2018.